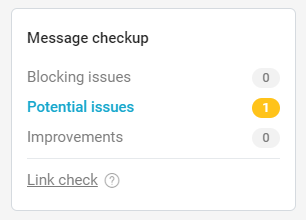 One glance at checkup and you can discover the “health status” of your message, and identify how to remedy any critical issues. All this to benefit the performance of your campaign. While rushing to send communications to our customers, we often leave out details that, even if minimal, affect the results of our campaigns. More than minimal, these details can be invisible as they do not concern external elements such as design or copy, but rather technical aspects that affect Message performance at a deeper level. Last year, in this post, we had created a list of fatal errors that can be made while managing Email Marketing activities. Among such errors was not carrying out a delivery test. Today we want to resume our discussion, to explain how, with MailUp, you can solve these problems right from the start, all you have to do is consult a section of the platform. Tests prior to sending are a well known best practice that is often overlooked due to haste, a lack of available testing devices, or a lack of variation of clients to send the test to. In B2C, it is also essential that you attempt sending messages to the primary email portals (Hotmail, Gmail, Yahoo, Virgilio…). Message elements to be tested are not limited to these, but touch upon various other aspects such as links, tracking codes web analytics, email size and summary. 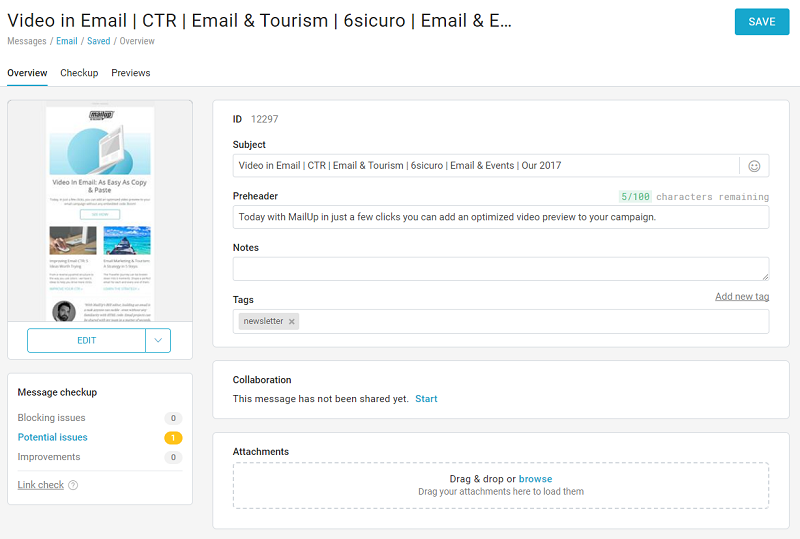 The MailUp platform can facilitate this fundamental Email Marketing activity by providing a small but useful tool to manage campaigns and to determine, at a glance, if there are critical issues from a technical standpoint; you find it by accessing the Overview page. Below the message preview you will find a box: Message checkup, offering you an overview, a sort of insight into the “health” of your message. The colored items are clickable, and lead you to the Checkup section within the Summary area (also reachable from the tab above the preview in the Overview section). Here you can find out the details of any problems and critical issues, which you can fix before sending. Are there any serious issues blocking the sending of emails? Is the link tracking active? Does it contain an unsubscribe link? Have any of the links included been blacklisted? Was the summary (or pre-header) added? Is there a web analytics tracking code? Is the message size optimized? These are the technical questions that every marketer should ask himself/herself, before sending a campaign, to optimize message mailings and avert repercussions in terms of deliverability: positive and negative effects that, in both cases, directly affect those results (the most obvious) marketers most care about: receipt rates, reading percentages, and clicks. MailUp, in addition to checking these technical aspects automatically, provides you with one short explanation for each item, depending on whether the checkup has detected issues or not. In case of critical issues, most importantly, the platform will be able to point out on what, and how, to intervene to solve them. MailUp checks the performance of your email on 76 email clients, including smartphones, and tablets. In just a few minutes you can see how your message appears across multiple devices, simulating scroll, and screen rotation. You can access this useful feature from the Overview page; at the upper tabs you will find Once there, you can choose between Fast, Full and Browser preview (the latter does not use an email client). Incorrect links nullify a campaign and disappoint the recipient, thus affecting the reputation of the brand, and, of course, performance of the campaign and of any offer conveyed. For this reason, MailUp has a function that automatically analyzes the accuracy of your email links, checking that none of these have been blacklisted. Here, the platform offers you two useful tools: one that performs a test of the SpamAssassin score, analyzing the message content based on the algorithm; or a deliverabality test, namely mailing to a test list that does not contain “real” recipients. Two possibilities are also offered here: fast analysis, and full The second, requiring a little more time, checks the message on many more email clients, and is therefore recommended. For some time, we have been addressing HTML for email on our blog: here you can find some valuable articles that may be helpful for you. A fundamental precaution, in addition to the previous ones, is ensuring the proper message display even for those recipients that do not support HTML. An optimization necessary for leaving nothing to chance in terms of performance. 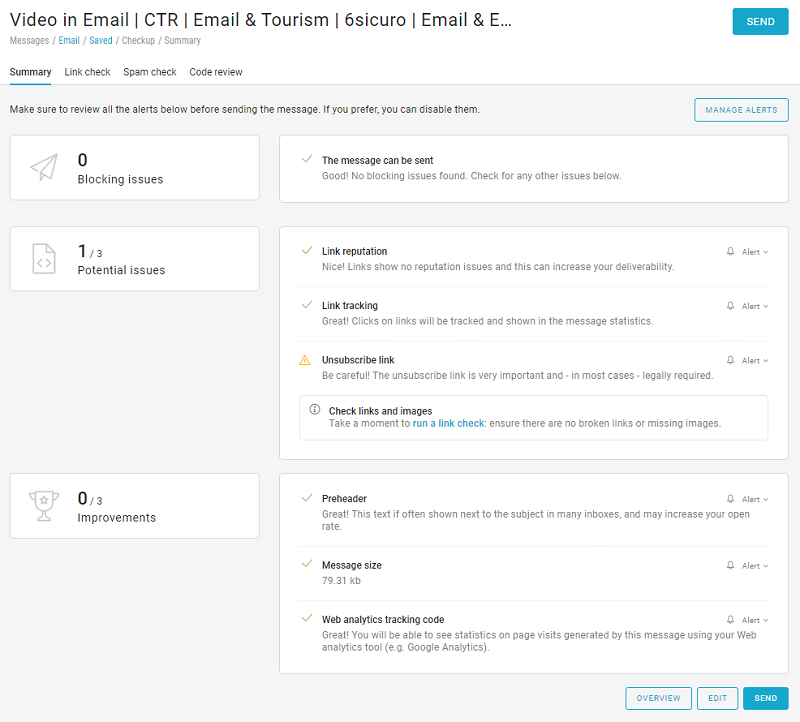 In short, the MailUp platform provides you with a tool that allows you to dramatically reduce errors in your communications. We recommend that you always take a look at the Checkup section before sending the message. From now on, you have no more excuses for avoiding technical errors in your campaigns. Have you not tried MailUp yet? Request a trial of the platform: you can use MailUp free for 30 days.